) through calcium channels. Calcium channel blockers are used as antihypertensive drugs, i.e., as medications to decrease blood pressure in patients with hypertension. CCBs are particularly effective against large vessel stiffness, one of the common causes of elevated systolic blood pressure in elderly patients. Calcium channel blockers are also frequently used to alter heart rate, to prevent cerebral vasospasm, and to reduce chest pain caused by angina pectoris. N-type, L-type, and T-type voltage-dependent calcium channels are present in the zona glomerulosa of the human adrenal gland, and CCBs can directly influence the biosynthesis of aldosterone in adrenocortical cells, with consequent impact on the clinical treatment of hypertension with these agents. This CCB class is easily identified by the suffix “-dipine”. Phenylalkylamine calcium channel blockers are relatively selective for myocardium, reduce myocardial oxygen demand and reverse coronary vasospasm, and are often used to treat angina. They have minimal vasodilatory effects compared with dihydropyridines and therefore cause less reflex tachycardia, making it appealing for treatment of angina, where tachycardia can be the most significant contributor to the heart’s need for oxygen. Therefore, as vasodilation is minimal with the phenylalkylamines, the major mechanism of action is causing negative inotropy. Phenylalkylamines are thought to access calcium channels from the intracellular side, although the evidence is somewhat mixed. Research indicates ethanol is involved in the inhibition of L-type calcium channels. One study showed the nature of ethanol binding to L-type calcium channels is according to first-order kinetics with a Hill coefficient around 1. This indicates ethanol binds independently to the channel, expressing noncooperative binding. Early studies showed a link between calcium and the release of vasopressin by the secondary messenger system. Vasopressin levels are reduced after the ingestion of alcohol. The lower levels of vasopressin from the consumption of alcohol have been linked to ethanol acting as an antagonist to voltage-gated calcium channels (VGCCs). Studies conducted by Treistman et al. in the aplysia confirm inhibition of VGCC by ethanol. Voltage clamp recordings have been done on the aplysia neuron. VGCCs were isolated and calcium current was recorded using patch clamp technique having ethanol as a treatment. Recordings were replicated at varying concentrations (0, 10, 25, 50, and 100 mM) at a voltage clamp of +30 mV. Results showed calcium current decreased as concentration of ethanol increased. Similar results have shown to be true in single-channel recordings from isolated nerve terminal of rats that ethanol does in fact block VGCCs.
) outside cells is normally about 10000-fold higher than the concentration inside cells. 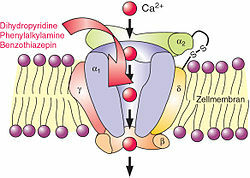 Embedded in the membrane of some cells are calcium channels. When these cells receive a certain signal, the channels open, letting calcium rush into the cell. The resulting increase in intracellular calcium has different effects in different types of cells. Calcium channel blockers prevent or reduce the opening of these channels and thereby reduce these effects. By blocking the calcium signal on adrenal cortex cells, they directly reduce aldosterone production, which correlates to lower blood pressure. Reducing the force of contraction of the myocardium is known as the negative inotropic effect of calcium channel blockers. Slowing down the conduction of electrical activity within the heart, by blocking the calcium channel during the plateau phase of the action potential of the heart (see: cardiac action potential), results in a negative chronotropic effect, or a lowering of heart rate. This can increase the potential for heart block. The negative chronotropic effects of CCBs make them a commonly used class of agents in individuals with atrial fibrillation or flutter in whom control of the heart rate is generally a goal. Negative chronotropy can be beneficial when treating a variety of disease processes because lower heart rates represent lower cardiac oxygen requirements. Elevated heart rate can result in significantly higher “cardiac work”, which can result in symptoms of angina. In 1021, Avicenna introduced the medicinal use of Taxus baccata for phytotherapy in The Canon of Medicine. He named this herbal drug “Zarnab” and used it as a cardiac remedy. This was the first known use of a calcium channel blocker drug, which were not in wide use in the Western world until the 1960s. ^ Tfelt-Hansen, P; Tfelt-Hansen, J (2009). “Verapamil for cluster headache. Clinical pharmacology and possible mode of action”. Headache. Review. 49 (1): 117–25. doi:10.1111/j.1526-4610.2008.01298.x. PMID 19125880. ^ Olson, Kent (2011). “40. Calcium Channel Antagonists”. Poisoning & drug overdose (6th ed.). McGraw-Hill Medical. ISBN 978-0071668330. ^ Nelson M (2010). “Drug treatment of elevated blood pressure” (PDF). Australian Prescriber. 33 (4): 108–12. doi:10.18773/austprescr.2010.055. ^ a b c Felizola SJ, Maekawa T, Nakamura Y, Satoh F, Ono Y, Kikuchi K, Aritomi S, Ikeda K, Yoshimura M, Tojo K, Sasano H (2014). “Voltage-gated calcium channels in the human adrenal and primary aldosteronism”. J Steroid Biochem Mol Biol. 144 (part B): 410–16. doi:10.1016/j.jsbmb.2014.08.012. PMID 25151951. ^ Chen N, Zhou M, Yang M, Guo J, Zhu C, Yang J, Wang Y, Yang X, He L (2010). “Calcium channel blockers versus other classes of drugs for hypertension”. Cochrane Database of Systematic Reviews. 8 (8): CD003654. doi:10.1002/14651858.CD003654.pub4. PMID 20687074. ^ “Calcium Channel Blockers”. MedicineNet. p. 2. ^ Norman M Kaplan, MD; Burton D Rose, MD (Apr 3, 2000). “Major side effects and safety of calcium channel blockers”. Chinese Medical & Biological Information. ^ Remuzzi G, Scheppati A, Ruggenenti P (2002). “Clinical Practice. Nephropathy in Patients with Type 2 Diabetes”. New England Journal of Medicine. 346 (15): 1145–51. doi:10.1056/NEJMcp011773. PMID 11948275. ^ Hockerman, G.H. ; Peterson, B.Z. ; Johnson, B.D. ; Catterall, W.A. (1997). “Molecular Determinants of Drug Binding and Action on L-Type Calcium Channels”. Annual Review of Pharmacology and Toxicology. 37: 361–96. doi:10.1146/annurev.pharmtox.37.1.361. PMID 9131258. Channel Antagonist Mibefradil (Ro 40-5967)”. Molecular Pharmacology. 48 (3): 540–49. PMID 7565636. Antagonists on Isolated Rabbit Detrusor Muscle”. Acta Physiologica Hungarica. 77 (3–4): 269–78. PMID 1755331.
channel in neurohypophysial terminals”. J. Neurosci. 14 (9): 5453–60. doi:10.1523/JNEUROSCI.14-09-05453.1994. PMID 7521910. ^ Tobin V, Leng G, Ludwig M (2012). “The involvement of actin, calcium channels and exocytosis proteins in somato-dendritic oxytocin and vasopressin release”. Front Physiol. 3: 261. doi:10.3389/fphys.2012.00261. PMC 3429037. PMID 22934017. ^ Chiodera P, Coiro V (May 1990). “Inhibitory effect of ethanol on the arginine vasopressin response to insulin-induced hypoglycemia and the role of endogenous opioids”. Neuroendocrinology. 51 (5): 501–04. doi:10.1159/000125383. PMID 2112727. ^ Treistman SN, Bayley H, Lemos JR, Wang XM, Nordmann JJ, Grant AJ (1991). “Effects of ethanol on calcium channels, potassium channels, and vasopressin release”. Ann. N. Y. Acad. Sci. 625: 249–63. doi:10.1111/j.1749-6632.1991.tb33844.x. PMID 1647726. ^ Walter HJ, Messing RO (August 1999). “Regulation of neuronal voltage-gated calcium channels by ethanol”. Neurochem. Int. 35 (2): 95–101. doi:10.1016/s0197-0186(99)00050-9. PMID 10405992. ^ Katsura M, Shibasaki M, Hayashida S, Torigoe F, Tsujimura A, Ohkuma S (October 2006). “Increase in expression of α1 and α2/δ1 subunits of L-type high voltage-gated calcium channels after sustained ethanol exposure in cerebral cortical neurons”. J. Pharmacol. Sci. 102 (2): 221–30. doi:10.1254/jphs.fp0060781. PMID 17031067.
channels”. Am. J. Physiol., Cell Physiol. 306 (1): C45–58. doi:10.1152/ajpcell.00047.2013. PMC 3919972. PMID 24153429. ^ Engebretsen, Kristin M.; Kaczmarek, Kathleen M.; Morgan, Jenifer; Holger, Joel S. (2011). “High-dose insulin therapy in beta-blocker and calcium channel-blocker poisoning”. Clinical Toxicology (Philadelphia, Pa.). 49 (4): 277–283. doi:10.3109/15563650.2011.582471. ISSN 1556-9519. PMID 21563902. ^ Buckley N, Dawson A, Whyte I (2007). “Calcium Channel Blockers”. Medicine. 35 (11): 599–602. doi:10.1016/j.mpmed.2007.08.025. ^ Yousef; et al. (2005). “The mechanism of action of calcium channel blockers in the treatment of diabetic nephropathy” (PDF). Int J Diabetes & Metabolism. 13: 76–82. ^ Lehne R (2010). Pharmacology for Nursing Care (7th ed.). St. Louis, Missouri: Saunders Elsevier. p. 505. ISBN 978-1-4160-6249-3. ^ Iseri LT, French JH (1984). “Magnesium: Nature’s Physiologic Calcium Blocker”. American Heart Journal. 108 (1): 188–93. doi:10.1016/0002-8703(84)90572-6. PMID 6375330. ^ Fleckenstein, A. (1983). “History of calcium antagonists”. Circulation Research. 52 (2 Pt 2): 13–16. PMID 6339106. ^ Tekol, Y. (2007). “The medieval physician Avicenna used an herbal calcium channel blocker, Taxus baccata L”. Phytotherapy Research. 21 (7): 701–02. doi:10.1002/ptr.2173. PMID 17533639. “Official Adalat (Nifedipine) site”. Bayer.